Applits has announced the launch of its Best Shot photography app on iOS devices. The app aims to make photography truly social, by encouraging the formation of social photo albums on specific topics. Once users create an album theme, others can post their “best shot” representing that theme. For instance, an album about coffee could see users posting a picture of their favorite morning cup, while an album entitled “Your View” would inspire users to take pictures of the world currently in front of them. Whether whimsical or serious in tone, these albums are like hashtags kicked up a notch. Users can like and comment on their favorite photos for more social interaction, and can see how many individual contributors have posted a photo to a particular category. Applits recently received honors as Inc.com’s Coolest College Start-Up of 2014. The company, founded by college students Keith Shields and Joshua Tucker, focuses on crowdsourced app development, with projects built with help from over 12,000 people around the world. 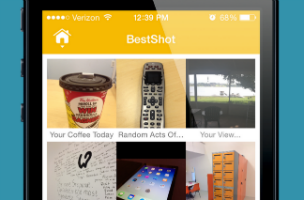 Best Shot is the company’s ninth app, and is available to download for free on iOS.